This decal sheet comes in 1/72 scale. 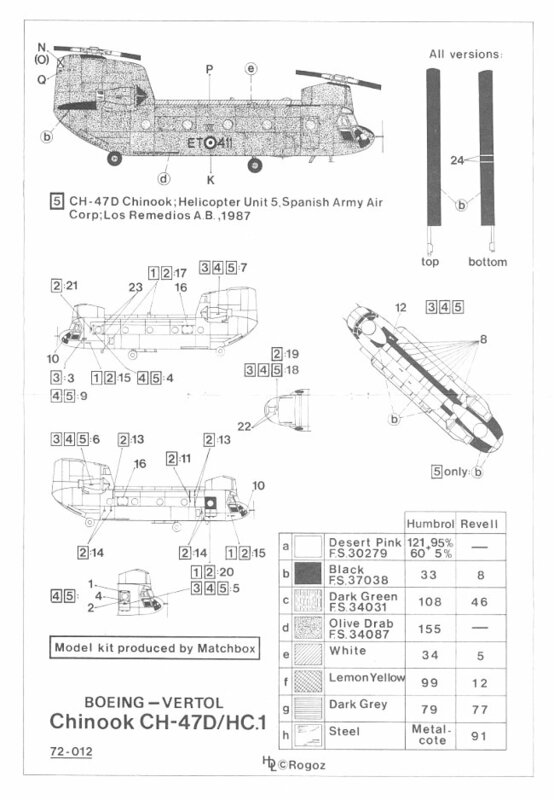 The decal sheet includes stencils for one of five Chinook's, plus markings for the 5 different Chinook's. 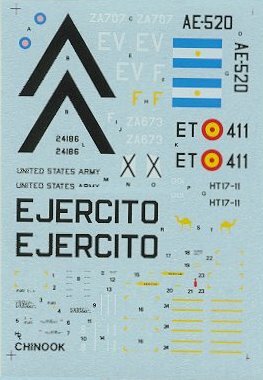 This decal sheet covers three Chinooks from Desert Storm in early 1991 (2 Raf machines and one US army Chinook) as well as one Argentinean Chinook from the Falkand War in 1982 as well as a Spanish Chinook. The painting options include everything from a special night scheme for one of the RAF Desert Storm Chinooks to Desert Pink for another Desert storm Chinook to Olive Drab for the Spanish and Argentinean Chinooks. The RAF Desert Pink Chinook includes nose art of a camel. The quality of the sheet is good....excellent colours.....clear printing and completely in register although the stencil data for the 1/72 stencils are too small to be clearly printed and readable. I recommend this sheet to anyone looking for interesting options to the kit decals or for the modellers interested in Desert Storm markings. Recommended kit is the 1/72 Matchbox kit. 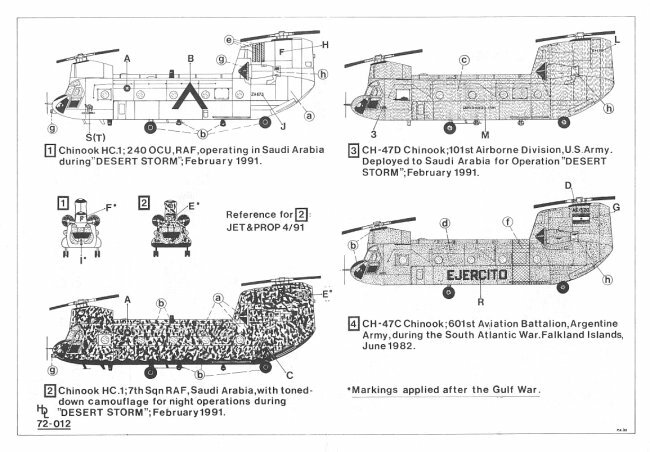 Decal option #1 is a Chinook HC.1;240 OCU, RAF, Operating in Saudi Arabia during Desert Storm in February 1991. The paint scheme is Desert Pink FS 30279 with a Yellow Camel nose art on both sides. Decal option #2 is a Chinook HC.1;7th Sqn RAF, Operating in Saudi Arabiawith toned down camouflage for night operations during Desert Storm in February 1991. The paint scheme is Desert Pink FS 30279 with a Black FS 37038 "spots" and a Black FS 37038 underside. Decal option #3 is a CH-47D Chinook of the 101st Airborne Division of the US Army. This Chinook was deployed to Saudi Arabia for Operation "Desert Storm" in February 1991. The paint scheme is Dark Green FS 34031.  Decal option #4 is a CH-47C Chinook of the 601st Aviation Battalion of the Argentine Army during the South Atlantic War on the Falkland Islands in June of 1982. The paint scheme is Olive Drab FS 34087. Decal option #5 is a CH-47D Chinook of the Helicopter Unit 5 of the Spanish Army Air Corps out of Los Remedios Airbase in 1987. The paint scheme is Olive Drab FS 34087.